They came from governments, the United Nations, civil society, churches and other faith-based organizations to discuss the impact of Cyclone Idai that has wreaked death, havoc and destruction on Malawi, Mozambique and Zimbabwe in recent weeks. Meeting at the World Council of Churches in Geneva on April 5, WCC deputy general secretary Dr. Isabel Apawo Phiri, who is from Malawi, said the gathering was called with a focus on protecting the poor and people in vulnerable situations. "The gathering has been effective in awareness raising. In this way, we are trying to show there is a need for partnership between the churches and government," which she said should work hand in hand to "respond to the disaster that has happened already." Governments and international agencies believe the death toll from the climate-induced disaster is at least 1,000 and likely to climb higher as hundreds of thousands have been left displaced, homeless and traumatized. More than 1,000 cases of cholera have been confirmed in Mozambique now that the inland ocean that formed is slowly starting to drain, leaving vast areas of stagnant water, World Food Programme reports. It's almost three weeks since tropical cyclone Idai ripped through central Mozambique, killing more than 500, destroying houses and leaving whole villages and towns submerged. 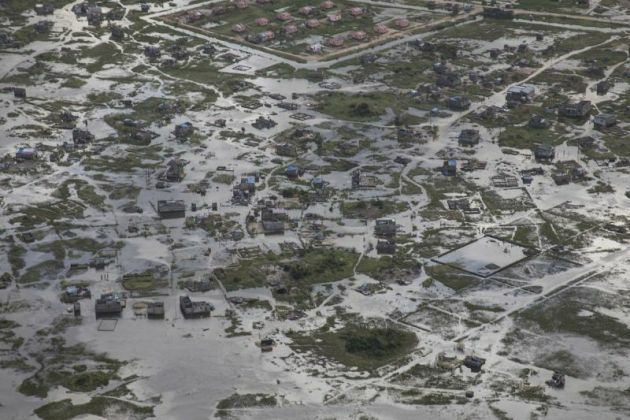 Ninety percent of the port city of Beira , with some 600,000 residents, the base for humanitarian efforts , was underwater and some 1.8 million Mozambicans are now in urgent need of some form of assistance. Top diplomats from the three neighboring countries attended along with Alwynn Javier, head of Humanitarian Affairs for the WCC's ACT Alliance; Roland Schlott, humanitarian coordinator for the Lutheran World Federation - World Service and Constanza Martinez Sr the United Nations representative for World Vision International; as well as a member of the United Nations Office for the Coordination of Humanitarian Affairs and others from the WCC and non-governmental organizations. The WCC deputy general secretary, whose title entrusts her to work on public witness and diakonia, said the gathering was organized in the spirit of United Nations Sustainable Development Goal 17: Revitalize the global partnership for sustainable development. It was also looking at SDG 11.5: reduction of the number of deaths and the number of people affected by disasters, including water-related disasters, with a focus on protecting the poor and people in vulnerable situations. Mozambican ambassador to the United Nations in Geneva Amadeu Da Conceição thanked the WCC for organizing the event that has created a regional disaster in Southern Africa and for coming to the assistance of the affected countries. 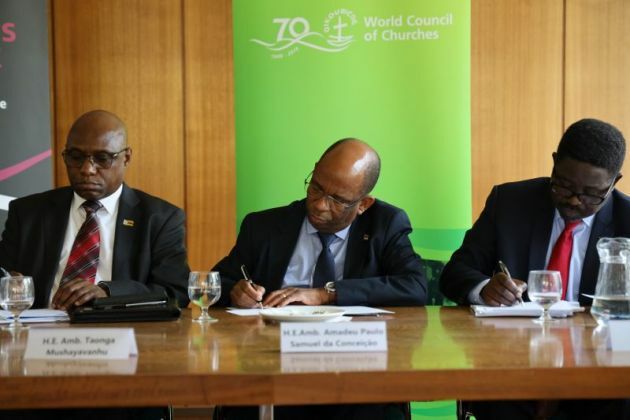 "By organizing this gathering, WCC is showing its engagement to serve all the people of the world in both good and bad times," said the ambassador. Cyclone Idai is regarded as one of the worst tropical cyclones on record to affect Africa and the Southern hemisphere as a whole," he said describing how it made landfall on the evening of 14 March in the city of Beira in the centre of Mozambique. The United Nations said that 1.7 million people were in the path of the cyclone. In Mozambique, Malawi and Zimbabwe as well, leaving a trail of death and displacement, the cyclone resulted in a loss of communication, damage and destruction of health, education and water facilities, economic and social infrastructures. The latest figures indicate that 598 people have been confirmed dead, 1,641 injured, 283,554 families have been affected by the cyclone which corresponds to 1,416,024 people. Scores of health units were destroyed, and there is a fear of the spread of water-borne diseases. Zimbabwe's ambassador to the United Nations in Geneva Taonga Mushayavanh also thanked the WCC for the event. "It provides us with both comfort and support as we share fellowship with other members of the community especially in these difficult times, these times of our greatest need when so many lives have been lost. "Indeed, the churches were among the first responders in terms of providing the centers to aggregate disaster assistance in the wake of the cyclone," said Mushayavanh, thanking churches and faith-based organizations as well as the international community for their response. He said the education facilities in some provinces of Zimbabwe had been severely disrupted, many of which he said were started by missionaries and are "still run by churches, your members." Malawi's deputy ambassador to the United Nations, Geneva Loudon Mattiya, said his country had launched an international appeal for emergency humanitarian relief assistance and that more than 730,000 people are in need. "Failure to adequately respond to current humanitarian needs is likely to have far-reaching consequences, facing such areas as crop production and food insecurity, water and sanitation issues, outbreaks of water-borne diseases and the increased risk of the spread of HIV and AIDS during the displacement period," said Mattiya. Phiri said one sobering observation made by Matthew Ross, WCC program executive for Diakonia and Capacity Building, was that the international response to the cyclone that flattened the Australian city of Darwin in 1974 has been massive, but the response to Cyclone Idai was relatively muted "because it is in Africa." The three diplomats said their governments are preparing appeals for development plans to seek to overcome the disaster induced by climate change that has once again heavily impacted people from countries that are poor in material riches. The churches' humanitarian organizations outlined their response plans as well. (Photo: © Peter Kenny)Zimbabwe's ambassador to the United Nations in Geneva Taonga Mushayavanh (L), Mozambican ambassador to the UN in Geneva Amadeu Da Conceição and Malawi's deputy ambassador to the UN in Geneva Loudon Mattiya at the World Council of Churches on April 5 discuss the impact of Cyclone Idai on their region.